Summer is on its way and most of us are planning our next trip! Browsing different booking plans for flight, taxi & hotel, and then finally jumping onto one is quite a task. Online travel agencies are the good alternative to search, discover, compare and book new outing plan. With proliferation of mobile devices, people find it more convenient to map their journey on mobile travel apps. According to Statista, by 2017, 30% of travel sales in the United States will be generated through mobile device. 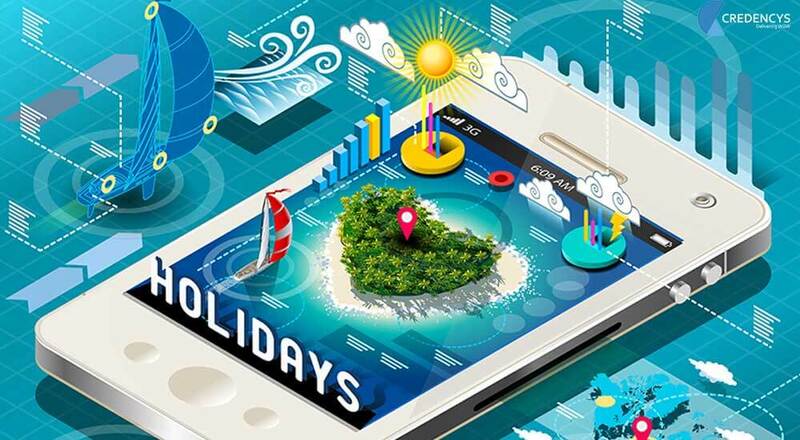 Mobile apps are presenting huge opportunity for travel agents and travel companies, and going mobile, companies can reap enormous rewards. According to App Store Analytics Company, 5% of all apps on the app store are Travel apps. And, out of all the mobile phone users who have downloaded the travel apps, 45% of them use an app for collecting data about trips. Understanding the importance of current trend and people preference, more and more travel agents going digital to render mobile experience to the customers. To know more about the benefits of embracing mobile solution by the travel agencies, click here. Some of the travel agencies have already created buzz with website presence, and there are few that bring their company to the top spot with the Mobile app. Global online travel company offers a broad range of travel products and services enabling leisure and business travelers search, plan and book their new excursion. Orbitz mobile app integrated with one more feature of pushing notifications to the users upon the airport arrival. The worldwide result of Orbitz first quarter 2015 has shown that 34 percent of standalone hotel bookings were made via mobile devices across the company’s global consumer brand portfolio, up from 30 percent in the first quarter 2014. Plus, the company has customized its mobile app for the Apple Watch for easier access and Orbitz reward program is on the go. The ultimate searching app is used by more than 35 million people each month. The app is marked for finding million of flights, hundreds of airlines, hiring cars and discovering hotels at the cheapest price. Once a user finds out the best deal, they can book the itinerary directly in a few taps as there is a link directed to the given service or travel agent. It is observed that 77% of the global increase in visitors comes from mobile devices alone. So, Skyscanner illustrated mobile growth is continued to be key to the company’s strategy. In China, in 2014, 61% increase in unique monthly visitors is found and 162% in regular monthly visitors from mobile. Initially, only flight booking feature was available on the mobile app, but after integrating hotel and car hire services, non-flight contribution to overall revenue is increased by 47%. Eight year old company now provides one-touch flight booking, train reservations and hotel booking on mobile devices. Presently, 40% of company’s transaction is done on mobile apps and the average traffic is expected to rise to 80%. With presence in seven countries, company has over 100 million visitors and out of which 70% are repeated one. These three companies slipped into the shoes of their targeted audience, and outperform and outgrown. But, before launching mobility solution, you should consider following things. User interface- What customers like to see in the app? User experience- How customers would feel after using it? Promotion- What’s the marketing tactic to be used to make app impactful. The rule of the business is to follow changing trends and adapt accordingly. Going mobile is the part of it. Travel agencies figure out the user perspective and expanding their services. Online travel firms can opt for either having their own mobility solution or make their web app mobile friendly. Be ahead of the wave and go for a mobile solution!